We did a bulk order and got a great price. I think the more you order the better there pricing gets. Obsessed! Our bags look phenomenal! These bags are great! They are super durable and our logo looks amazing! I am very happy with the quality and the cost effectiveness of these. This was a great purchase! Quality wine totes for a great price! Cannot beat this, especially with the great assistance to make sure I got exactly what I wanted. Couldn't have been happier with this entire process! My customers love these. The logo looks great and they love how they are eco-friendly! Amazing to have a wine tote to give away at my winery that displays my logo and is reusable. I have a great deal going on for my customers in which if they bring the reusable bags back for their next purchase, I give them a 10% discount off there total. They are so excited about them! We sell an organic wine and wanted to partner with a ecofriendly company to make our wine totes. Custom earth promos has been great to work with. If anyone is reading this I suggest using them for any of there products for their service and great ecofriendly products. Really impressed! Our bags are strong and stylish. These are the perfect size! My clients use them all of the time! So glad we finally found a promotional product that won't break the bank! We just came out with a flavored vodka and are using this reusable tote bag to hand out a custom made sample half pint of the new flavored vodka at a industry event. The bag came out exactly how we wanted it to, I will be a repeat customer to custom earth promos for fulfilling this order for us perfectly. Overall we had a good experience using custom earth promos, there product and service was good. Well constructed wine tote. I recommend going with custom earth promos. I use this model reusable wine tote for my liquor store. It is much more functional then a brown paper bag. Very affordable pricing makes it easy to hand out to clients who purchase an upscale bottle of liquor. I don't use this bag for cheap liquors though. All my employees received this bag as a thank you for there hard work all year with a bottle of my families home made wine. It was a very simple process ordering this reusable wine tote. We give this to all clients who do our wine tour of our winery. It is a nice touch and the customers always love it and usually purchase a bottle of wine they liked on the tour and use the wine tote same day. We customized this bag for our champagne that we make, the bag came out great and plays off the color of our champagne bottle well. I manage an upscale italian restaurant and use this bag to package any leftover bottles of wine that our customers don't finish. I got the idea from a restaurant that I actually took my fiancee too. The customers love it and it has brought us repeat business. We consulted with there design department to create a fully custom wine tote from size and color it was personalized to our wine company. IF you want something unique that just isn't stamped out in a factory that everyone has they created a very unique reusable wine tote for us. I suggest custom earth to all of our suppliers who deal with wine companies for the fact that I know it will only help the enviorment as well. Thank you custom earth promos for helping us have a successful wine tasting event!!!! 80 GSM is a good thickness for a reusable wine tote. 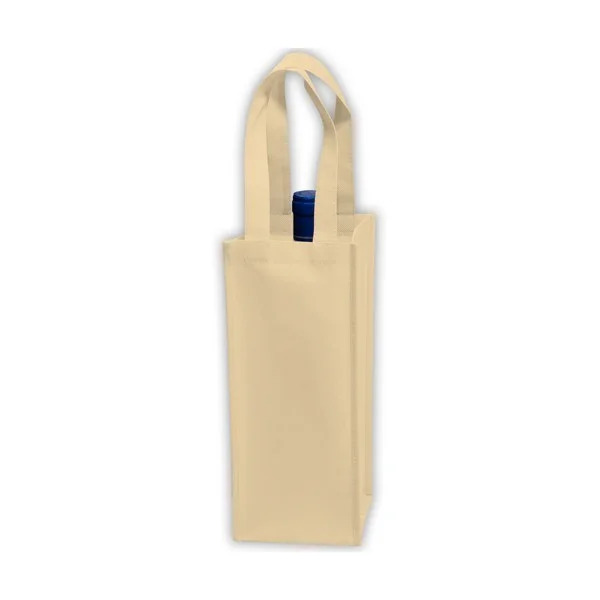 I use CEP for all of our marketing needs we just ordered our first reusable wine tote from them we are expecting the same quality as all the other products we get from them. Great color options, we selected the black and beige color bags. strong but smooth padding at the bottom of the bag, makes it easy to place bag with the bottle inside and not worry about it breaking. We received our bags fast and in good crafted quality. I would use them again based on the quick turnaround. These Wholesale Single Bottle Wine Bags are made from 20% post-industrial recycled material. So your decision to use them can go a long way toward establishing or furthering your brand's image and credibility as an eco-conscious environmental supporter. Choosing our Earth-friendly products is a simple but extremely effective way to impress and earn brand loyalty from both your current and potential customers. 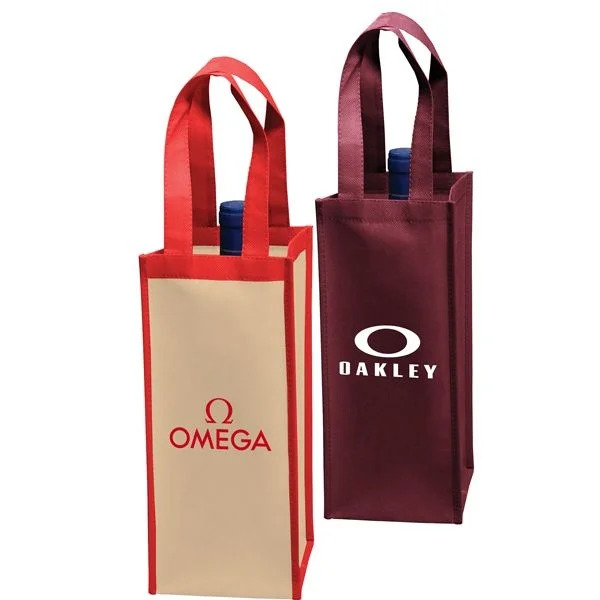 People really respond to these wine bags, and you’ll notice how quickly and enthusiastically attendees snap them up at trade shows, corporate gatherings, promotional events, business parties, store openings—anywhere they can get their hands on them. 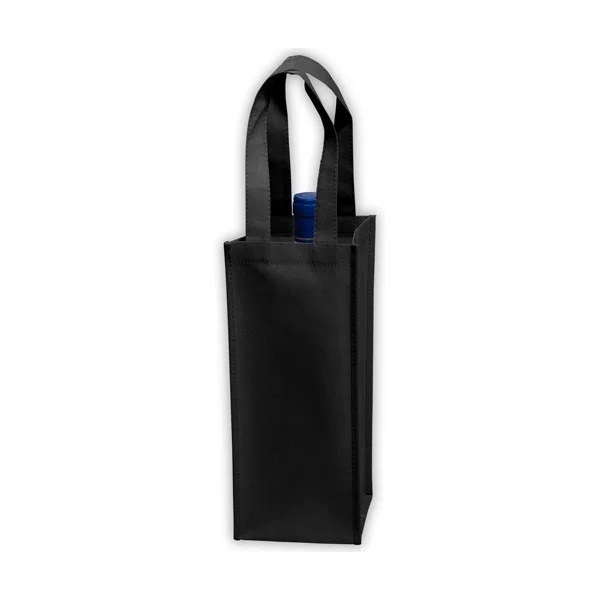 Compact and stylish, the Wholesale Single Bottle Wine Bag Collection from Custom Earth Promos is sure to be one of the most popular promotional giveaway gifts you ever distribute. Customers love to give and receive this fashionable tote as a gift. And that makes it a favorite marketing tool of our many clients in the hospitality and food and wine industries. This bag features an imprint area of 3" W x 7" H, to give your brand logo imprint all the space it needs to steal the spotlight anywhere it goes. Adding a catchy slogan can boost your exposure rate even further, helping you build your client base and grow your business. Custom Earth Promos can produce your shipment of Wholesale Single Bottle Wine Bags in your choice of 5 stylish colors: Black, Burgundy, Red, Royal Blue & Tan. These sturdy 5” W x 12” H x 5" D bags also feature 5-inch gussets and convenient 12-inch handles to make carrying wine and other contents safe and comfortable. So many of our clients—resorts, hotels, restaurants, bars, wineries, and liquor distributors, to name just a few—have already discovered what a powerful and effective marketing tool these bags can be. You can get your custom-made bags in your favorite color or even combine multiple colors at no extra charge. Our design experts are at your disposal to help you to create your own original imprint design based on your vision for your brand image and values. You can even add a custom slogan and/or other special messaging or promote a cause or special event. Before we ever ship, each and every product we make undergoes a complex battery of safety and quality assurance tests to ensure they are free of any harmful pollutants, to comply with California's Proposition 65 guidelines. We take all possible measure to guarantee that our products are safe for both your customers and the environment. When you choose Wholesale Single Bottle Wine Bags from Custom Earth Promos, you have the option to order direct overseas for these fully customized brand-enhancing wine totes. You can be sure that your entire order will be competitively priced and ready for delivery in just 8 to 12 weeks. Plus we offer multiple customization options, including end-to-end printing, color matching for bag fabric and brand logo, added insulation and/or pockets and dimension adjustments—all at no extra charge.